Specially-formulated, CAT PUMP exclusive V-Packings provide unmatched performance and seal life. V-Packings are also cooled and lubricated by the liquid being pumped while lubricated Lo-Pressure Seals provide double protection against external leakage. Hardened and polished stainless steel valves and seats are included to provide ultimate seating and extended valve life. Pump heads are available in brass, stainless steel, or aluminum bronze for strength and corrosion resistance. Triplex plunger design provides smooth liquid flow. Concentric, high-density, polished, solid ceramic plungers provide a true wear surface and extended seal life. Oil bath crankcase provides optimum lubrication. Die cast aluminum crankcase ensures high strength, lighter weight, and precision tolerance control. Chrome-moly crankshaft gives unmatched strength and surface hardness. Oversized crankshaft bearings provide greater loading capacity which means longer bearing life. 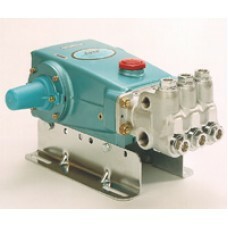 Wet-end is easily serviceable without entering crankcase, reducing time and effort for pump maintenance. Valve assemblies are easily accessible for quick service. Inlet and discharge valve assemblies interchange for easier maintenance.